MORE THAN 4.3 MILLION CALLS were made to U.S. Poison Control Centers in 2009. Of the calls made, 13% were related to exposure to painkillers, 9% concerned cosmetics or personal care products, and 8.6% were about household cleaning products. Children younger than 6 were involved in about half of all poison exposure calls. Although most people think of poisoning is a childhood issue, adults are overwhelmingly the cause for the recent increase in unintentional poisoning deaths. Poisoning is now the leading cause of unintentional injury death in Washington State, surpassing deaths from motor vehicle crashes and from falls. In Washington State from 2009-2013, there were 3,786 deaths from unintentional prescription drug overdose; and 2,086 unintentional overdose deaths from prescription opioids (narcotics). The Sumner School District was awarded a Drug-Free Communities Support Program grant by the White House Office of National Drug Control Policy. One benefit of the grant is the distribution of free lock boxes throughout our communities. A poison is any product or substance that can harm someone if it is used in the wrong way, by the wrong person, or in the wrong amount. Potentially poisonous items could include some household products, chemicals at work or in the environment, drugs (prescription, over-the-counter, herbal, illegal or animal medicines), snake bites, spider bites, and carbon monoxide. Poison exposure can occur through the eyes/ears, on or through the skin, by breathing them, or by swallowing something you shouldn’t. If someone has been poisoned, follow the first aid instructions if you can. Then call your poison center right away. The poison center experts will tell you exactly what to do. They will frequently follow-up with you by phone to be sure that everything is all right. DO NOT wait to call! If you call right away, the problem can often be taken care of over the phone. Don't wait for symptoms. What are the most common poisons for adults? 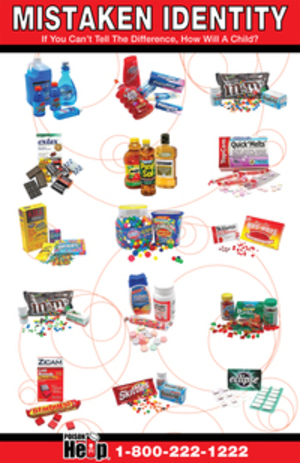 Pain medicines: such as asprin, oxycodone, acetaminophen, methadone, and ibuprofin. Medicine take-back programs for disposal are a good way to remove expired, unwanted, or unused medicines from the home and reduce the chance that others may accidentally take the medicine. The local agencies below are equipped to accept expired and unwanted medicines. Check them out! The sour green face is still around and more ready than ever to help prevent poisoning in your home. 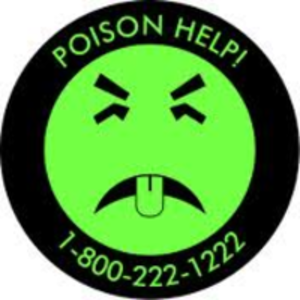 Visit Washington Poison Center to request free Mr. Yuk stickers and download a poison safety checklist and safety tips.